The thing that caught my eye was the funky sign. Here I was, scouting around Lawrence Avenue looking for a bite to eat and I see this sign that says "Mekeni: Taste of Pampanga." Ohhhh, what's this I wonder? I would love to taste Pampanga, whatever the heck that is. After I peeked around the dusty door leading inside, I quickly grabbed a menu and realized it was Filipino food. And, further, it was a buffet. But, I took one look at the steaming hot box full of sauced-up meats and determined that my suddenly sensitive belly was better off across the street at the El Salvadoran joint on the corner. Pupuseria Restaurant Cuscatleco had one lone couple chowing down when I plopped into my corner booth. I could see their plates of homemade food in the mirrors that made up the East wall. 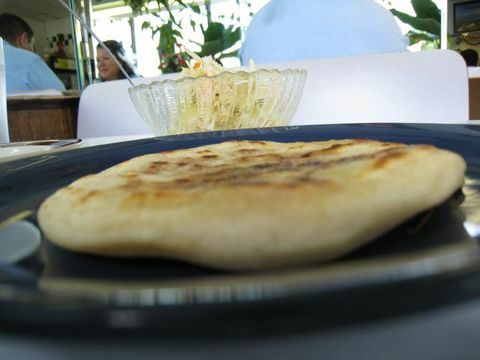 Lots of chunked-out pupusas is what I'm talking about. 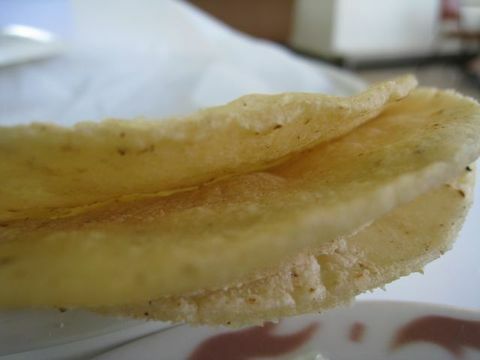 In typical El Salvadoran form, I immediately set to ordering some of those, as well as a hen tamale. 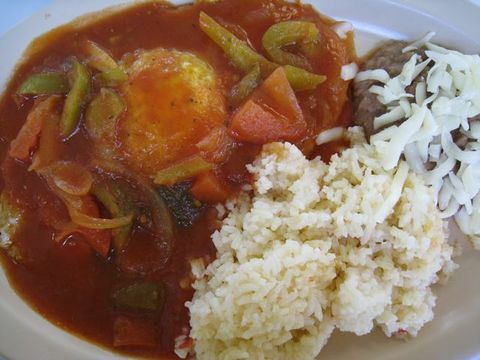 Not to leave my good friends, the Mexicans, out of the bunch, I requested a nice big plate of huevos rancheros as well. 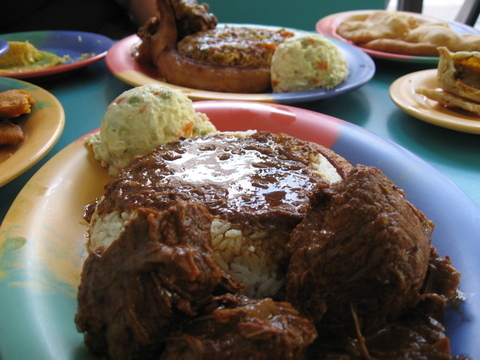 What have you ever heard about Belizean food? I'm betting pretty much nothing, and I'm not sure why that is. 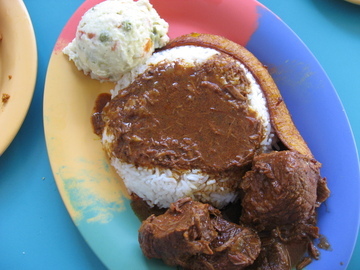 It's some of the most lip-smacking grub on the planet, at least as far as Tickie's Belizean Restaurant is concerned. This tiny joint has been doling out affordable food for just over a decade, and once you taste it, you'll know why the husband-and-wife team has kept it up as long as they have. It's easy to compare every type of Central American cuisine to that of mammoth Mexico, but Belize's cuisine couldn't be further from typical Mexican food (even though only a river separates baby Belize and mama Mexico). To me, Belizean fare tastes much richer, more concentrated and, dare I say, better across the board. There's nothing even remotely familiar about the flavors of Belize, save for the starchiness of the steaming pile of rice served with most meat dishes. South of the Border Slurping--It's Always Time for Soup! The whole world loves chicken soup, and at the first hint of cold weather, there's nothing more appealing to the taste buds than a piping hot bowl of it. 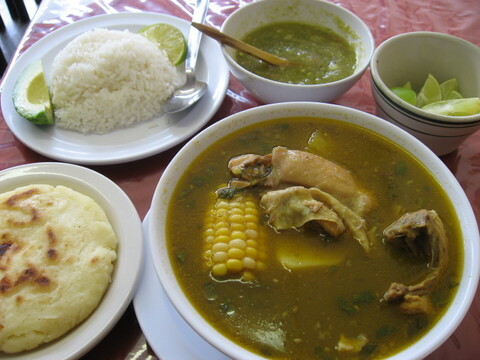 But not all chicken soups are alike, especially when it comes to the tasty Latin American versions courtesy of those glorious countries south of the border. Our friends down south tend to mix it up with a variety of ingredients, which usually—but don't always—include chicken, garbanzo beans, pasta, onions, carrots, potatoes, yucca, cilantro, onions and lime. You'd be surprised at how one country's take differs from another—even when they're plugging in the same dang ingredients! The restaurant’s been open for ten years, but business has slowed due to the never-ending construction on Howard Street, which discourages diners from even getting to Tickie’s homespun food. 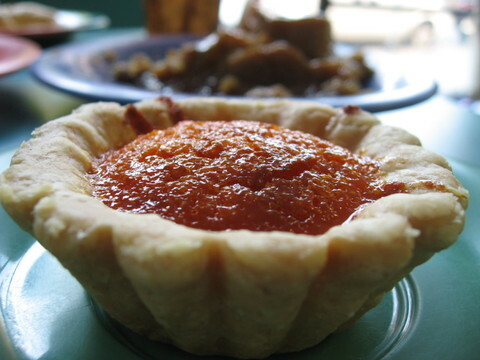 “There’s no shortcut in Belizean cooking,” Clardia says. “Every dish starts from scratch.” The budget-friendly menu is peppered with habanero-tinged dishes, including fiery chicken, spoon-soft beef and rich braised oxtail. Just as it would be in the Youngs’ home, each dish arrives with a pile of rice, soupy beans, chunky potato salad and sugary curls of fried plantains. It’s a substantial spread, but not enough to deter us from also ordering every appetizer on offer. With apps less than $3 apiece, you could make a meal of the conch fritters, chicken tamales and deep-fried cornmeal patties stuffed with ground fish, called panades. In fact, the Youngs hope you do. 7605 N Paulina St at Howard St (773-973-3919). El: Red to Howard. Bus: 22 Clark (24hrs), 215 Howard. Breakfast, lunch, dinner. Average main course: $7. I'm always on the mad hunt for the perfect veggie burrito and I had the opportunity the other day to photograph the inside of Irazu's veggie burrito (usually I like mine served el suiza--covered in melted cheese--but there is no need for that with this special Costa Rican-style burrito). I would say, in my humble opinion, that this football-size burrito is absolutely the best veggie offering in the city as far as burritos go. It comes chock full of whole beans, rice, carrots, sour cream, avocado, and tomatoes and what makes it really stand out (re: blistered into your memory) is the smattering of earthy sauteed mushrooms...they're so thick and remind the taste buds of the texture of meat. It's a little on the pricey side (almost $6), but this thing can easily be split between two people and if you do find your way over to Irazu, you must order an oatmeal shake (made with horchata)--which is yet again, one of the best things I've ever slurped down. They also have great sweet plantains and chips & salsa. Lately I have found myself more and more attracted to Guatemalan, Colombian, Peruvian, Ecuadorian and Salvadorian restaurants. I feel like their food is fresher, their meat leaner, their salads crisper and their drinks stronger. But the attraction often leads to a long haul to far-away neighborhoods. For some reason, the best joints seem to be out the outskirts of the city, and Restaurante el Salvador is no different. 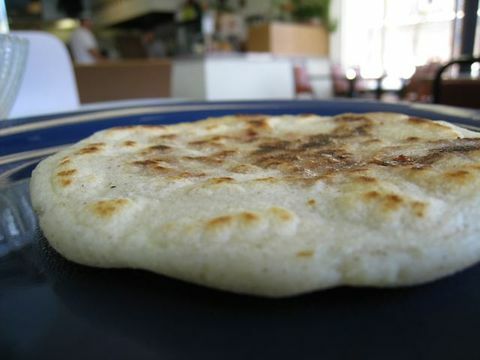 Located on a charming little stretch of Archer Avenue in Brighton Park, this cafeteria-looking Salvadoran restaurant—and its pupusas—have me hooked. But what really gets me is its ground beef taco. Sure, sure, it's on the Mexican side of the menu, but I'm always blown away by the warm, thick, homemade tortilla that encases some of the juiciest bits of ground beef I've ever sampled. The fat tacos, loaded with lettuce, tomato, onion and sour cream, literally make my heart stop. I eat them so quickly, I've never even had the chance to take a picture. Food is so damn simple. I don't know why I complicate it so much. It's always surprising to I realize that I can be happy with something small: chunks of fried yucca; a frozen, rum-laden pina colada; a warm tamale; a minty mojito. Ever since I got back from Nicaragua last week, I've been craving those four things in major doses. Fortunately, I brought back a fantastic stash of homemade mojitos; the other three are a different story. To fulfill my intense craves, I immediately head to El Tinajon, my neighborhood Guatemalan joint. Not only does it serve spine-chillin' margaritas (usually my drink of choice), it pours a fantastic pina colada. I ordered one a few months ago on a whim (thanks to a $5 special) and can't seem to get enough since. Served in a frozen ceramic coconut mug, the drinks are made with chunks of real coconut, the liquor pour is heavy and it comes sprinkled with little slivers of fresh coconut that always has me chewing the last sips of my drink. I can officially say that today, I tasted something that my world weary (but still learning and accepting) tastebuds have never tasted; a moist, Salvadoran sweet cheese cake made with parmesan cheese. The first bite was so shocking...I didn't really expect the tangy influence of parmesan cheese to take over the cake, but it did. It was served barely (and just enough) warmed and was soft like sponge cake, but also reminded me of cornbread, with a sprinkling of crunchy sugar specks on top. It was also remniscient of an Italian olive oil bread (it had that sort of density) that I whipped up once from a Real Simple magazine recipe (I was convinced that I'd make millions off that lifted recipe, but, sadly, it was never again duplicated). 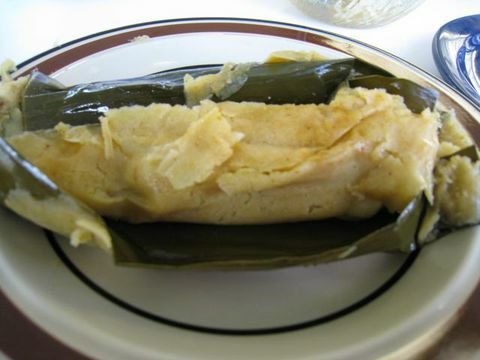 Called pastel de alote, this poundcake-like treat is found at Restaurant El Salvador way down on 41st and Archer. It is absolutley worth the haul, especially if you love the sweets like me (They also have my new favorite pupusa in the city; I've been on quite a journey with those corn cakes, lately.) If they'd only had some hot chocolate, I'd have been in Salvadoran heaven...but I'm sure if I'd swilled the chocolate, too, my afternoon nap would have lasted all damn night instead of the three hours that I claimed....rather, that claimed me. After piles of El Salvadoran food, a coma comes on quick, trust me. I'll go anywhere for a good meal. One close-up picture of a piece of sizzling bacon in a magazine could send me on a whirlwind adventure half way across the world at a moment's notice (this year's food fascinations had me apartment switching with total strangers and spending weeks exploring the side alleys in Barcelona, as well as driving from Chicago to the tip of Baja, Mexico, in a 7,000-mile fish-taco quest). That sort of attitude can get quite expensive, though, and I've been trying to lead the globetrottin' life every day in Chicago in the meantime. Thankfully, that's pretty dang easy to do with 'hoods like these, and I never worry because there's always going to be a new place sprouting up around the corner if you look close enough. That said, I've tired of my usual haunts and I'm finding myself going on further jaunts to find new places to eat. I'm trekking up north (La Donatella di Cucina is one of my favorite Italian restaurants and has a magnificent octopus salad); I'm heading down to Pilsen (Nuevo Leon has my favorite version of huevos rancheros for less than $4); and I'm jamming out west (Pollo Campero's chicken is much admired). But this past haul was one for the books: Almost 20 miles (one way) and $5 in tolls (round trip) led me to Pupuseria el Salvador, a tiny hole-in-the-wall practically in Indiana. The trip was absolutely worth it, but this was just for a simple lunch; such drama for a small bite to eat, you know? I've been hearing so much about Pollo Campero, the Latin-inspired chicken hut lately that I finally hauled out to see what all the fuss was about. When I peeled into the parking lot (belly screaming), there was a full band playing in the parking lot (meanwhile, 9 pm on a Sunday night) and the line was almost out the door. What is the damn deal with this chicken? The place was packed with Latin American's ordering up platter after platter (though this is a fast food joint, they do use real plates and have a friendly host) of chicken, campero beans, cole-slaw, rice with peas, plantains, mashed potatoes, tortillas and biscuits. I quickly followed suit. Side note: They sell close to 17 tons of chicken per week. That is almost freaky. No, strike that. It is full-on freaky.